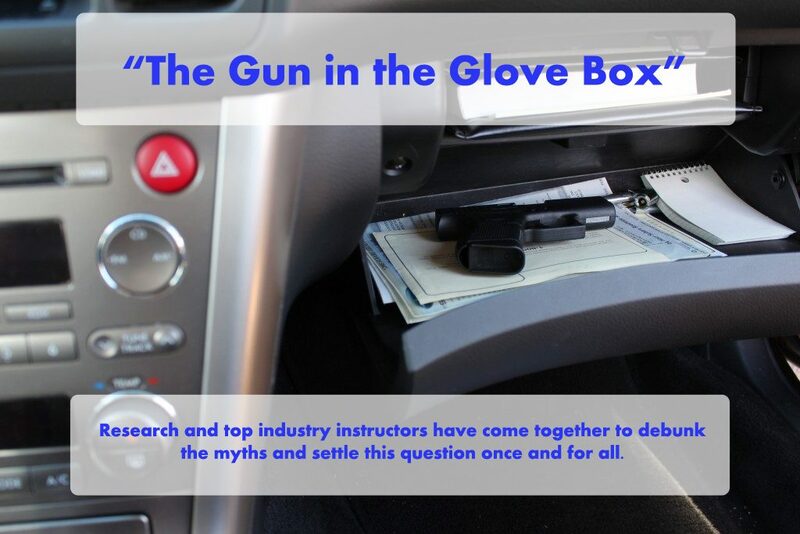 Below I explore all the various angles and issues surrounding firearm storage in the car with a specific emphasis on the glove box or glove compartment. Outside of our homes and our place of employment the next place where we spend the most time is in our vehicles. Additionally, our cars often carry us to places of greater amount of risk than our own home or work. The reasons for needing a firearm with you for defense in the car abound. Further, since every concealed carry permit holder should feel empowered and encouraged to carry every day; just by using a vehicle for any transportation the vehicle becomes a transporter of the firearm as well. In addition to the ability to respond to threats the gun also has need to be stored for a short while or long term in the vehicle on occasion. When a gun owner visits a “Gun Free Zone” like the post office or travels across state lines it becomes critical to have a secure and accessible storage system for the gun in the car. 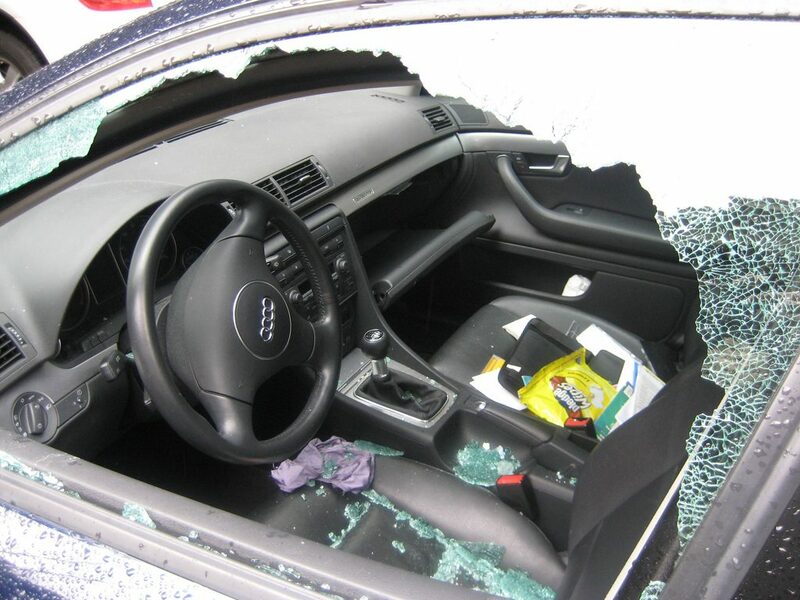 Theft from vehicles accounts for 36% of all thefts according to the department of justice. 1.255 Billion dollars of personal belongings are stolen in 1.85 million car thefts each year. That essentially calculates to a 1 in 100 chance that any US citizen with a drivers license will experience a vehicle theft each year. When the thief breaks into your car where is the first place they always look? The console and the glove box. Thieves know these are the most common places to keep electronics and the best place to find your home address (via the registration and insurance cards). Keeping a gun in the glove box is a sure way to invite it to be stolen. The glove box may have a lock on it but it isn't made to withstand force. A little bit of leverage with a crowbar and that very weak lock will give way. Add to this that should you lock the glove box and then begin to drive away, forgetting to retrieve it, you will be forced to stop the car in order to retrieve the key needed to unlock the glove box and access the gun. If you are in a position where you need to secure your firearm in the car when entering a premise where you can't have your firearm or when transporting the firearm across state lines you don't want to be seen shoving something into the glove box. At the parking lot of the post office, you don't want the people in the car next to yours seeing you slip that gun into the glove box. So if you intend to leverage the federal firearm protection act in your favor in order to transport firearms across state lines you need a lockable container that is dedicated to that purpose. Strong: Strong enough to prevent unauthorized entry by thieves, children, or other unauthorized persons. Secured: Secured to the car be either a security cable or by mounting it to the frame with screws. Easy and Fast to Operate: Able to open and close readily with limited time. We recommend the Sports Afield line of Lighting Safes. This simple safe is affordable while managing top standards of quality and easy of use. Capable of holding one to two handguns, this safe is easy to program and use. It is also easily secured to any part of the car with an included security cable or the pre-drilled screw holes. I have a FL concealed carry. I have a gun safe cabled to the front seat when I’m going to leave the gun in the car. My normal concealed carry is difficult to get to in a seated, seat belted position. When I asked the state about other places to carry my gun when I’m driving and I was advised that as long as it wasn’t visible from outside the car, any place was fine. My solution was to mount a holster inside my console to hold my hand gun while I’m in the vehicle. According to Louisiana Law your personal vehicle is an extension of your HOME. There are no limitations on where in the car for ammo or the firearm. If you are on a campus such as the LSU campus or any public area that is “gun free” as long AS IT REMAINS IN YOUR VEHICLE it is still within your “home” and legal. Right on Austin, La is friendly to gun owners and yes our cars or trucks are an extension of our homes! The same in GA, our vehicles are an extension of our homes. Wouldn’t it be great if the entire country had this same law. Your automobile is an extension of your home. In NM I have the ability to have a concealed loaded firearm in my motor vehicle irrespective of having or not having a concealed carry permit as NM also is a state that recognizes extended domain. My rights in my vehicle are exactly the same as my rights in my home or anywhere on my property. I own the very same lock box shown above. It works wonderfully up until the battery (9V) begins to weaken, but long before the box signals the battery is weakened. When that happens it may take many tries with passing the appropriate finger over the sensor to get the box to open. If you need thagt gun in a hurry you do not want to have to deal with a stubborn lock box! Hence, either plan to change the battery fairly often or keep the manual key handy. If you travel with the lock box, start w a fresh battery and remember hot cars weaken batteries much more quickly. Otherwise, it’s the perfect traveling companion. 4 AA is the same voltage = 9V so it’s the same power needed. It should be removed and holstered as soon as you enter the car. When we took our conceal carry class, the instructor clearly said that it is better to be judged by twelve than to be carried by six. Did you not take math in jr/hs? AA batteries are 1 1/2 volts each, times 4 is 6 volts not 9. No one cares about how much power it takes. We all know we have to replace batteries on a regular basis. It’s actually a good point about the battery. I live in South Florida and the heat kills the batteries quickly on my flashlights that I carry in the truck. I was thinking about getting that exact same safe, and maybe I still will, but now I do want to do some more looking first. I have a fingerprint lockbox at home with external charger but I mainly use it to keep children from accessing my weapon while still having it quickly available. Securing it in the car is another matter I think. 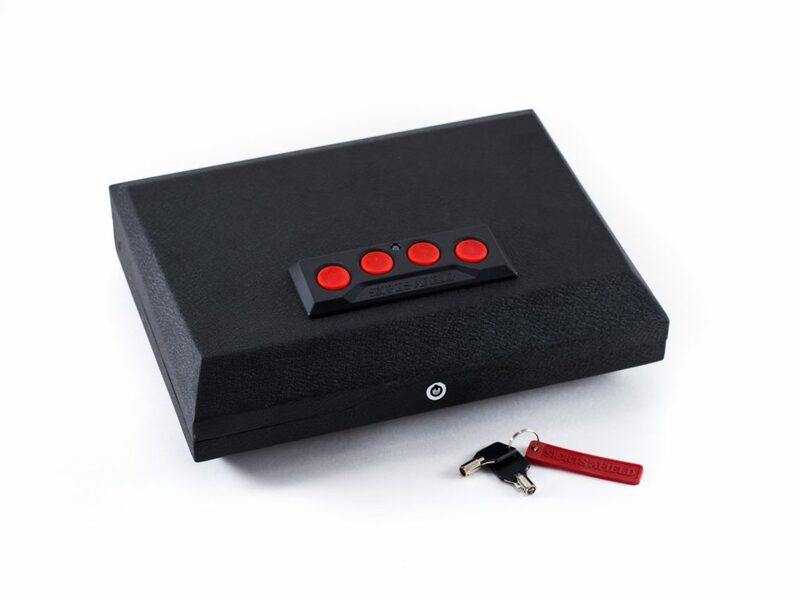 Thieves don’t care if it is in a portable safe if they can see it as they will break in, steal the whole thing and pry it open at another place. So what to do? If you can’t carry concealed because of a gun free zone you need to enter you are left with other means to conceal it. There are places you can find where the portable safe can be secured out of sight and where it can be bolted down. I have a place but I leave that up to you to find your place. I’ve always wanted to carry, but never really known where I would put it. I think a car is a great place to keep a gun, because I think you’re more likely to be in or near your car when a dangerous situation happens. 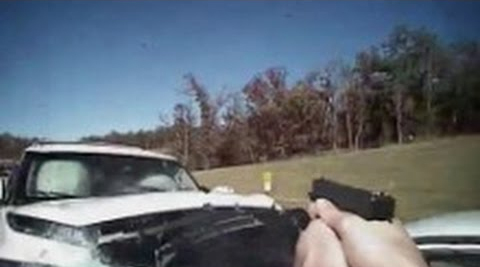 I agree that you shouldn’t keep a gun in the glove box. Kids have access to it, and I think that’s really dangerous. I thought the gun safe with the finger printing lock was really cool. No one is going to be able to get in there but you! Check out Console Vaults on line. I have a Calif CCW, and carrying any firearm in the glove box or console is a major no no! If I so happen to enter a “gun free zone”, I simply take my firearm off my side and put it in my Lock’er Down gun safe that is mounted in my truck console. Mounted or attached is the key word. William, I’ve been trying to get a answer to a question . I too a licence ccw permit holder in California . Can I carry a gun on my person while in a car. Yes or no. I’m not talking about a lock box but as a carry. If you’re going to spend THAT kind of money for an electronic safe, consider having it powered by the vehicle battery (yes, math fans, you CAN convert 12 DC volts to other voltages) and then the dead device batteries will be a much lower probability. The round Ace type lock like the one pictured can be picked with the barrel of a plastic “Bic” pen. The plastic tube is pushed into the lock wiggled and turned until it opens. That is why soda machines and U bike locks don’t use them anymore. I tried it on my stack on gun cabinet and had it open in less the 3 minutes. Needless to say I don’t use it anymore. AJ, we don’t delete any comments. Perhaps there was a technical issue or something similar. Please resubmit your comment. We were allowed to CC and open carry while hunting in Vietnam. No better hunting grounds. I have a single gun safe mounted in my truck console. My company allows the gun on the property with a CCP. I lock it in the safe when I get to work and unlock when I get off work. Same for other places I can’t carry. The console is always unlocked for easy access. I would never leave my gun in a car, safe or no safe. The car can be driven away and there goes my gun. I have a carry permit so I keep the firearm on me in the car and out of the car. We need two things to happen. Number one get rid of all gun free zones period and we can start by setting an example by eliminating the post office as a gun free zone. I believe that is an obsolete law and needs to catch up with current society. Second we need nation wide right to carry as you should have the right to protect yourself no matter where you are PERIOD. I’m with you Fred. Interesting posts though. Unfortunately, Post Offices aren’t just gun free buildings, they are gun free property also. You can not have a gun even in the parking lot. If you get caught you are doing jail time. Luckily I reside in Georgia and we are able to have handguns in the glove box, etc. Considered an extension of home. No carry conceal needed. I do a lot of driving in Ga and my gun is in my car more than anywhere else. And there have been a few occasions where I felt better knowing it was there. My husband said it was ok to leave a gun in an unlocked glove box at the tire repair. Is this ok? I said no and he says they would never look in the glove box.who is right?